Thanks for liking The Everywhereist. Like TIME on Facebook for more trusted news analysis, award-winning multimedia & behind-the-scenes looks with TIME editors. Geraldine DeRuiter's husband Rand has a job that takes him around the world. 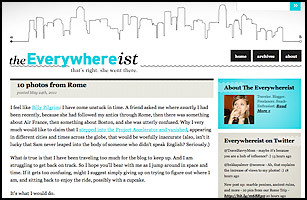 After she was laid off from her job, she started tagging along with him and blogging their experiences at the Everywhereist. It's hardly your average travel blog: DeRuiter is as likely to write about confusing bathroom fixtures, inexplicable foreign TV shows and obnoxious airplane passengers as she is about picturesque towns and exquisite restaurants. She says she blogs to help Rand remember where they've been and what they've seen. But this consistently clever site lets the rest of us go along for the ride too  even when the couple is just hanging out at home in Seattle.